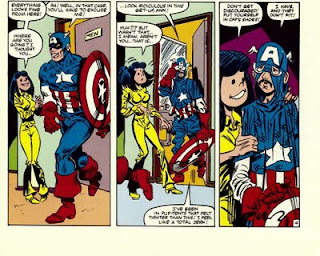 Since the multimillion blockbuster 'Captain America' movie was released last weekend, I thought it was a good time to look at another AEM story that (sort of) featured Cap. 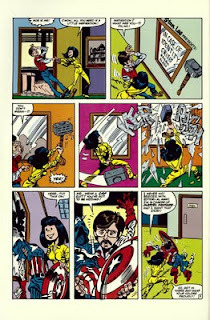 'Marvel Fanfare' was launched in late 1981 (#1 was cover dated March 1982). It was an anthology series printed on glossy Baxter paper. Most issues contained more than one story. Since the book's Editor also served as its "mascot", 'Fanfare' was more AEM-ready than any other title! But back to #12, starting with the cover. The Black Widow is the main attraction(since the first story of this issue is part 3 of a 4-part Widow story), and it's a "normal" story. 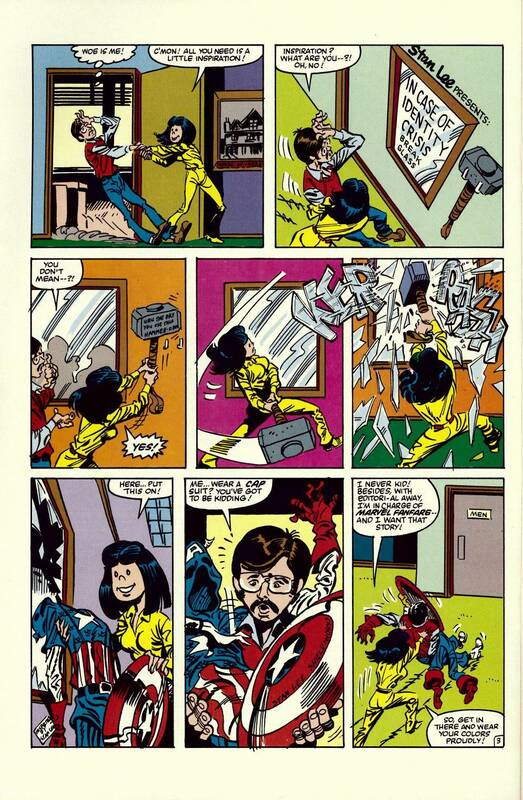 But the corner box shows Milgrom getting pushed aside by Assistant Editor Ann Nocenti, who was featured in an earlier post. 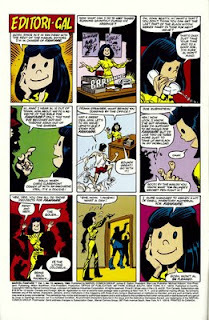 With Editor Milgrom "away" at the Comic-con, Nocenti also takes over his strip, renaming it 'Editori-Gal'. We get appearances from several Marvel creators pitching ideas for future 'Marvel Fanfare' stories. 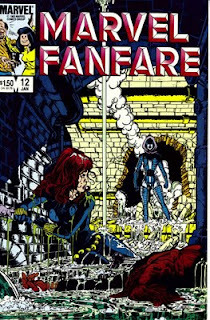 She approves all the story proposals and acting as Editor of 'Fanfare' seems to come naturally and easily to Nocenti. Check out the "sketch" of Longshot behind Nocenti in the 2nd panel, 2 years before the character mad his debut! 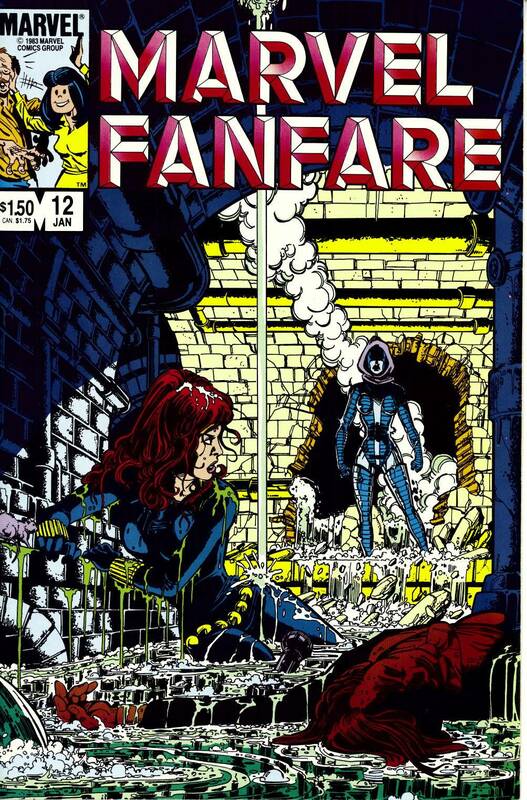 After the Black Widow story, we get to 'Marvel Annfare', written by Nocenti and Roger Stern, with Milgrom providing the art. It sort of picks up where 'Editori-Gal' left off. Stern rushes in to Nocenti's office. Stern's upset because no Editors are present and he has ideas he wants to pitch to them. The Assistant Editors don't have the authority to approve of future storylines beyond AEM. Stern is worried he won't be able to get ahead of schedule, which was rare in those days. 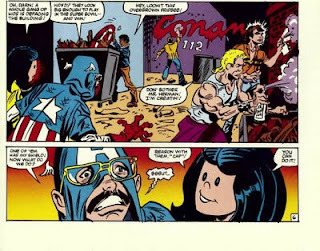 Nocenti points out that he has extra time to work on an upcoming Captain America story that will be published in 'Fanfare'. Stern is too depressed to write the story, so Nocenti decides he needs inspiration. 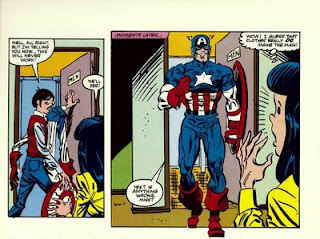 She (literally) breaks out a Captain America costume for Stern to wear, hoping to spark his creativity. Check out panel 3 on the above page for a horrible pun about Thor's Uru Hammer! 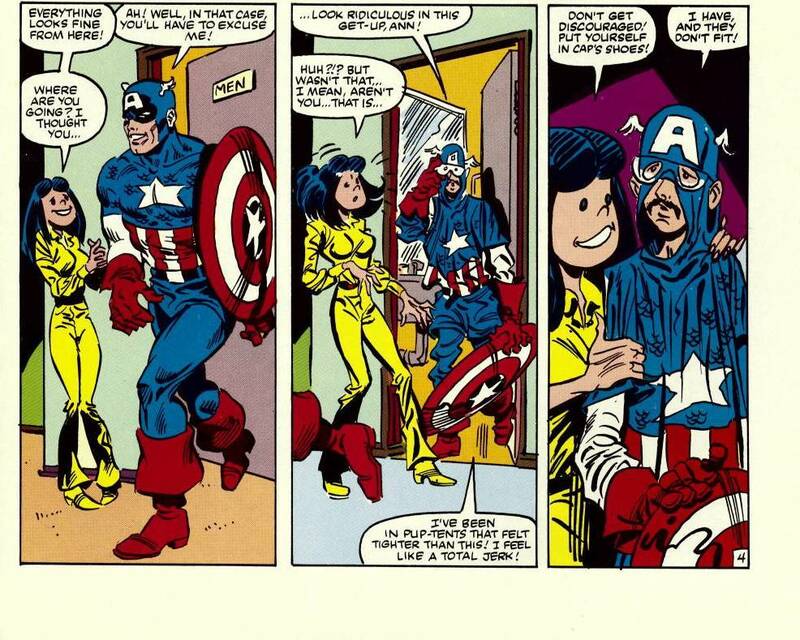 Stern dons the Cap suit, and Nocenti is impressed with how great it looks on him! 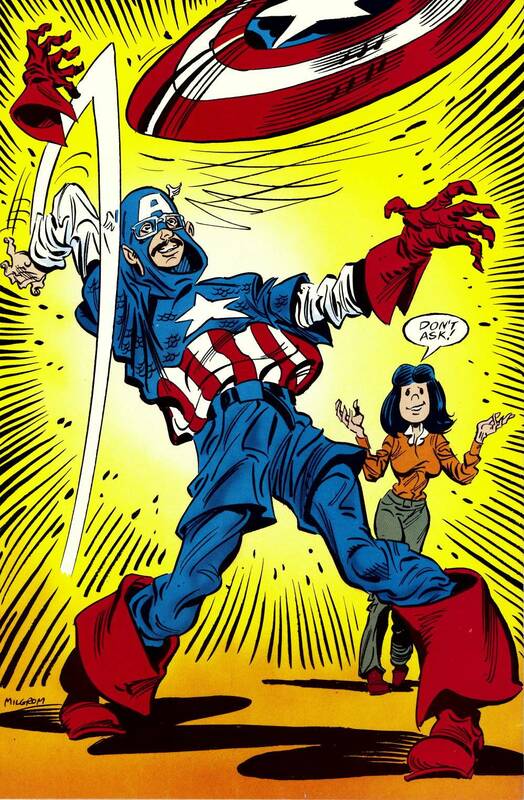 Stern used to write Cap's series and remembers that Cap's principles not his strength & agility were his defining characteristic. 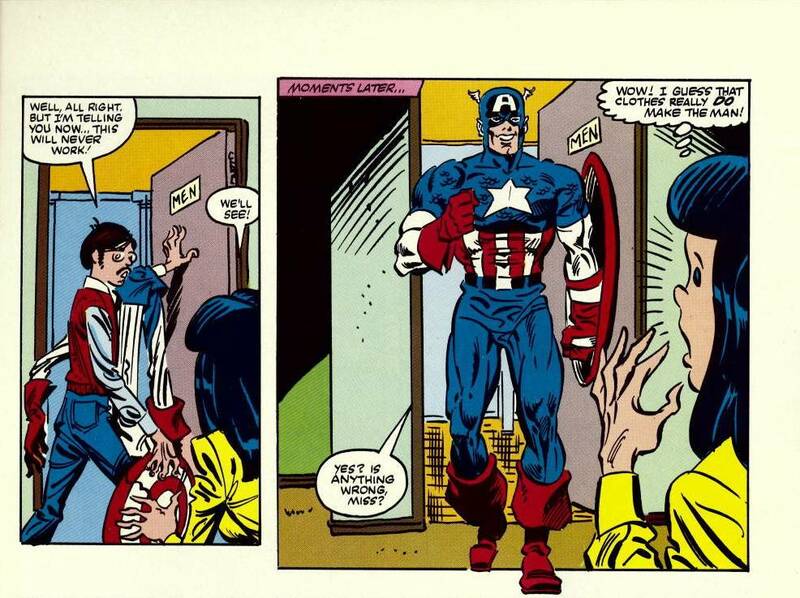 He waxes poetic about Cap being a symbol for the qualities that make America great. 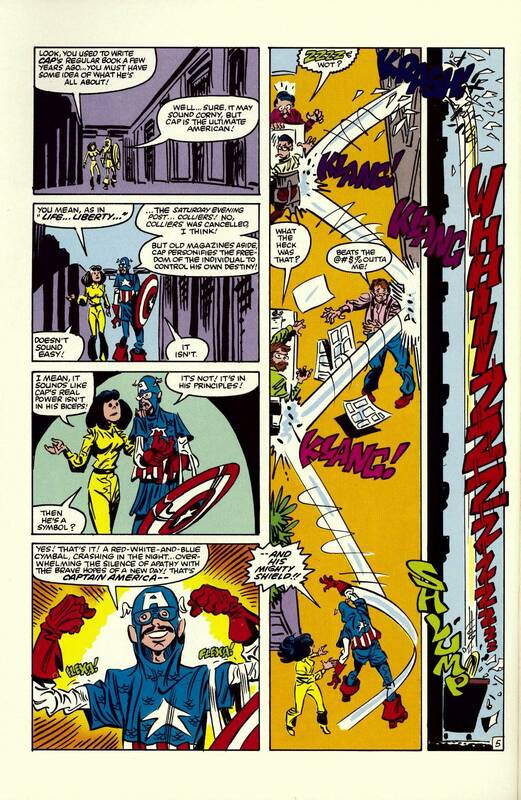 Stern then gets a little gung-ho and throws Cap's shield around the Marvel offices. The shield bounces off walls and eventually out the window into the garbage. 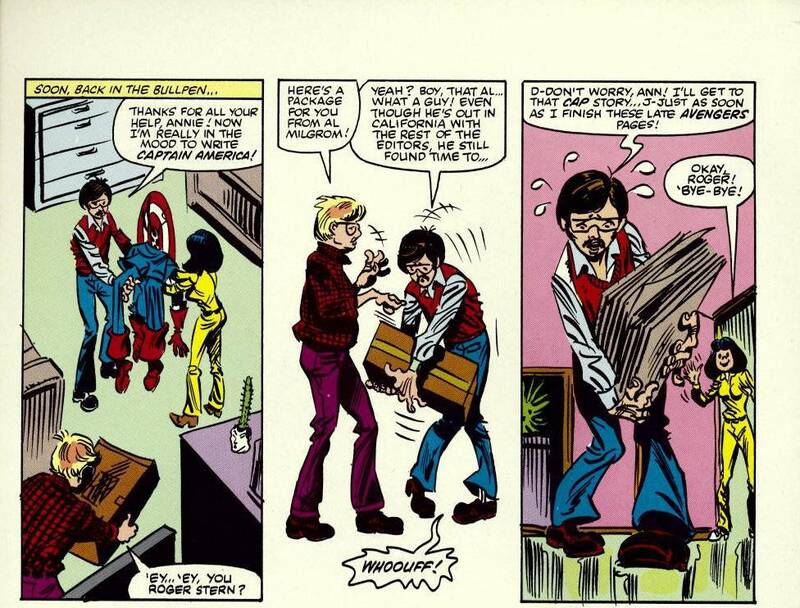 After debating about what sound effect the shield made when it hit the dumpster, they go outside to retrieve it, but are frightened by what they see. 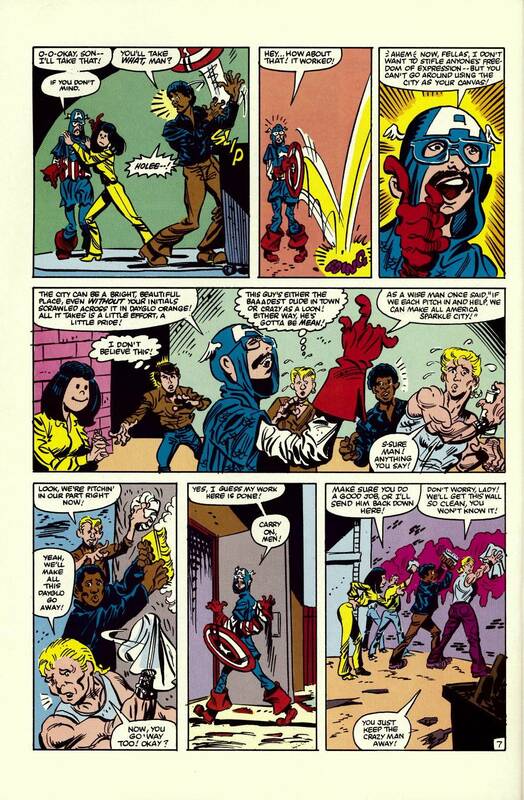 They stumble on a gang of tough, scary looking vandals who are defacing Marvel's exterior walls! 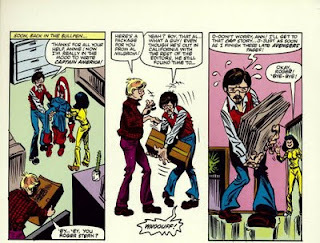 One of them pulls the shield out of the dumpster and Stern is reluctant to ask him to give it back. 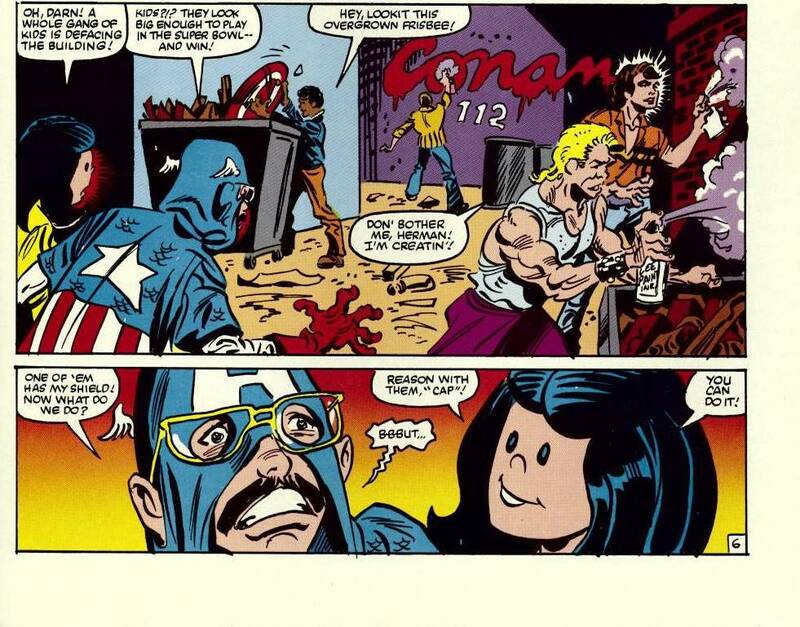 Nocenti tells him to embrace his inner-Captain America and reason with the vandals. Much to his surprise, "Captain Ameri-Stern" is able to talk down the vandals and actually convinces them to take pride in their city. They proceed to clean their graffiti off the walls! They return inside, Stern takes off the suit. He is ready to write the Cap story and thanks Nocenti for aiding the creative process. But suddenly a package from Al Milgrom arrives. It's a stack of Avengers stories for Stern, so the 'Captain America' story is pushed to the back burner. 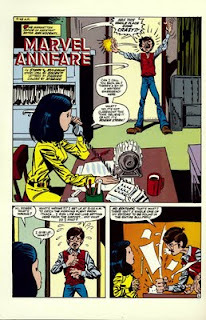 Feeling a sense of accomplishment, Nocenti returns to her desk. 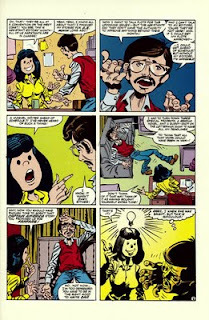 Suddenly, another writer rushes in with a similar problem:It's Bill Mantlo! His proposal for a Rocket Raccoon/Jack Of Hearts team-up has been turned down by Marvel. 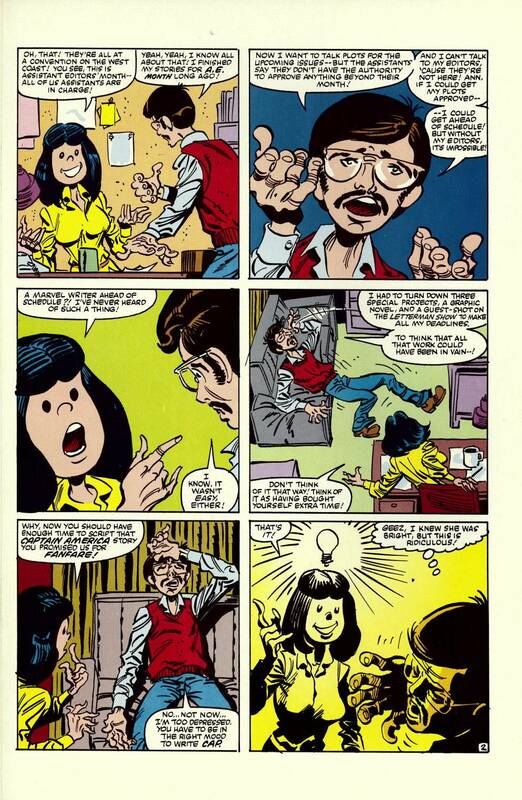 Nocenti realizes that she's in for a long day, and she has learned that being a full-time Editor is hard work. The end. Another funny story from AEM. 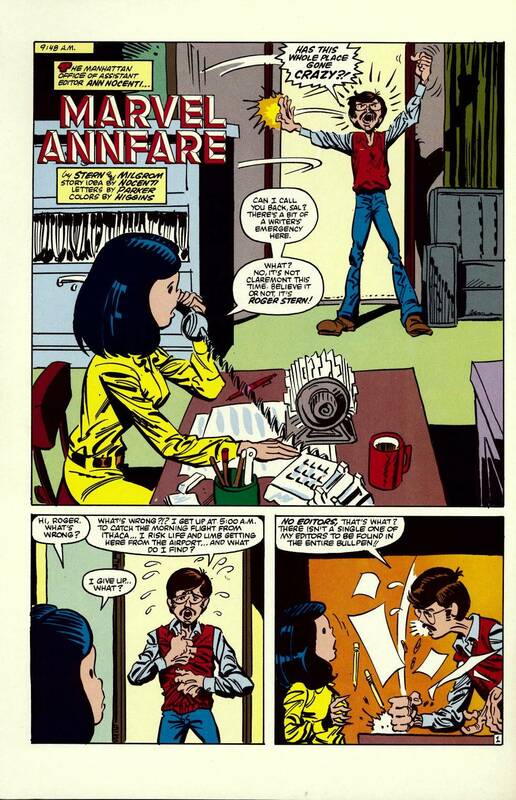 I love the "Orphan Annie" eyes that Milgrom gives Nocenti. 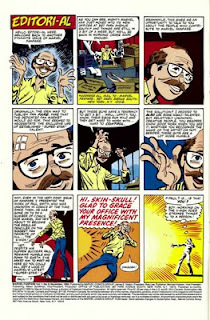 It was nice to flashback to the old Marvel Bullpen and the cameos of 80s creators (including the late Frank Springer). 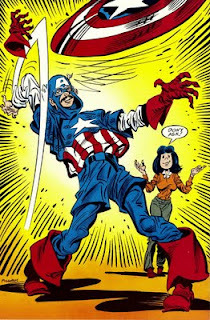 And while we're on the subject of Stern & Captain America, I recommend all readers pick up the Captain America tpb called 'War And Remembrance', written by Stern. 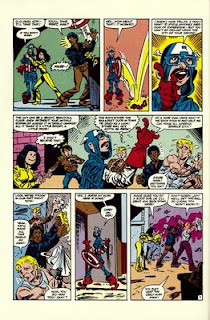 I contains some of the all-time best Cap stories! 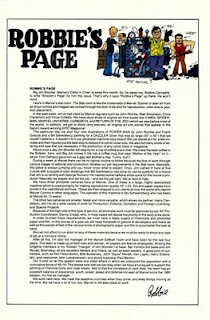 The issue ends with 'Robbie's Page'. 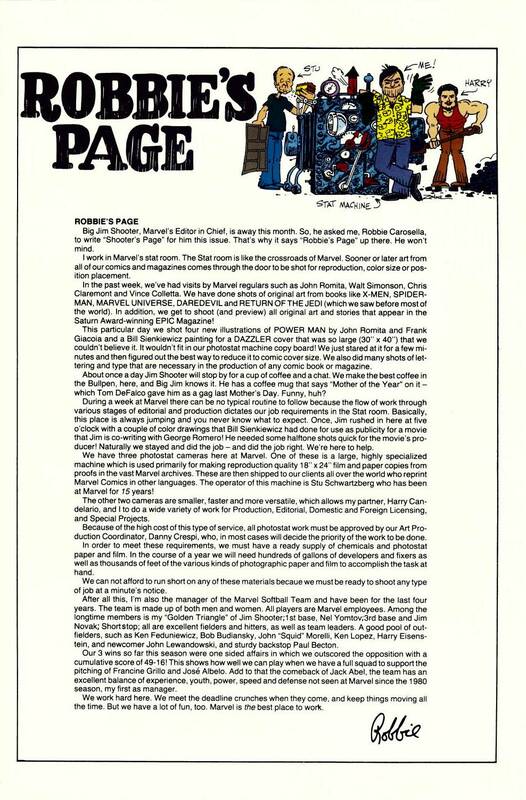 'Fanfare' normally ended with 'Shooter's Page', a column written by Editor In Chief Jim Shooter. He would talk about the industry, offer commentary on comics, storytelling techniques, stuff like that. 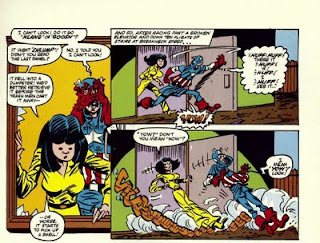 But since it's AEM, this month's edition was written by Marvel Colorist Robbie Carosella. 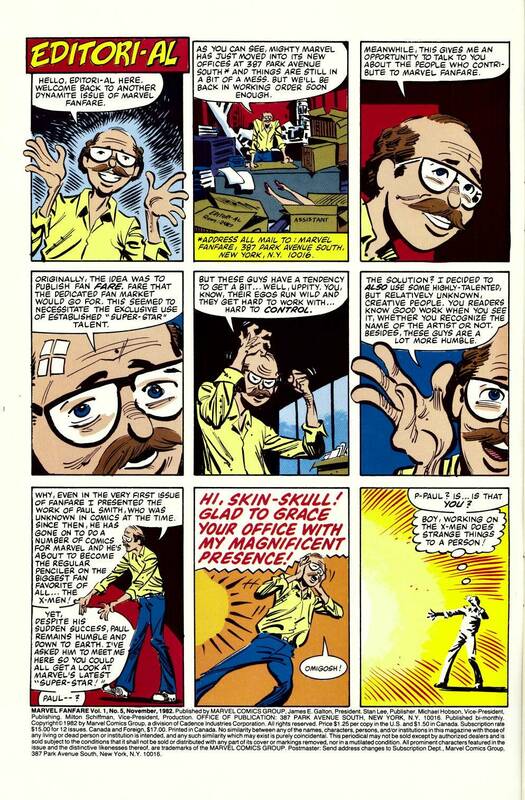 He talks about his work in the Marvel Stat room and the Marvel Softball team, which he managed at the time. Indiana Jones And The Raiders Of The Late Book! Thanks, I'd forgotten that Nocenti "appears" in that 'What If' issue. 'What If' #34 was one of my favorite comics as a kid! I haven't read it in years, but I remember a "gallery" of Assitant Editors that included Nocenti,Mike Carlin, Eliot R. Brown,etc. Never thought of it as a precursor to AEM, but you're right. Maybe I'll cover that issue when I've exhausted AEM stories.